William Frisby, a 39-year-old Briton, who is a department manager at a consulting company in Beijing, has been living in the city for eight years during which time he developed a love for buying Chinese counterfeit products. "Like everybody who lives in China, we have all bought fake DVDs and I've also bought fake designer brand clothing," he said. "The main reason is the cost; it's too good a deal to miss." He said he often purchased shirts and sportswear at clothing stores that sold "excellent quality fake clothes, just as good as the real ones." The Chinese government is strengthening its efforts in cracking down on counterfeits. On January 1, former Apple executive Matthew Bassiur took office as China's largest e-commerce company Alibaba's vice president in charge of the group's global counter-counterfeits units, finance.qq.com reported last month. Though many foreigners, both local and abroad, still like to buy Chinese counterfeits to satisfy their need to show off - in the case of high-quality knockoffs, an increasing number of expats are turning from imitations to authentic Chinese brands as they gain popularity in the market for their good quality and lower prices. Frisby knows that imitation clothing will not last long but considers their price worth the trade off. If he wants a sports shirt for the gym, he buys a fake Adidas or Nike from Silk Street market at between 50 yuan ($7.5) to 100 yuan. The original would cost him anywhere between 400 to 700 yuan. "Though after a few washes, the fake shirts will go out of shape, I will not spend that [much money] on an [original] shirt to go to the gym in. I am not one of those people who see exercising as a fashion show," he said. "When you go looking in the markets at the weekend, everyone wants to find a bargain; it's just too big a temptation to resist," said Frisby. 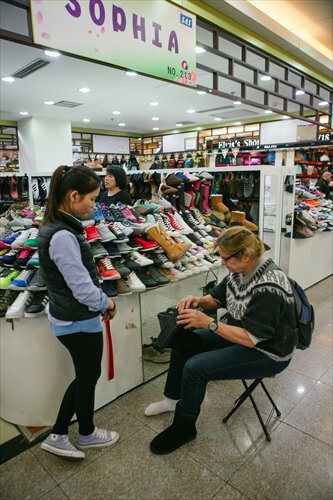 Steve (pseudonym), a 47-year-old American, who works at a consulting firm in Beijing, remembers buying some watches, shoes and ties at the Yashow Market before it was renovated last year. He said the vendors were quite aggressive, grabbing his arm and pulling him to come look at their goods. They would also claim to know him as they each jockeyed for his attention. "The best purchases are neckties. I don't buy a lot, but 10 ties for 200 yuan is a good deal," Steve said. Besides cheapness, the high quality of some counterfeits is another very big attraction for expats. Frisby knows one shop that sells excellent quality leather bags of copied brands such as Mulberry. "You can tell the quality, and the shop does not allow bargaining - the price is the price. I would never spend $500 on a bag, but I would spend $150 on a top quality leather fake, which is as good as the real one," he said. Frisby said that he only buys cheap copies if it's an item that he doesn't care about. However, he will buy a good fake if it's good enough. Steven Venn, a 40-year-old American and artist manager who has been in Beijing for four years, likes to buy imitation watches and handbags like Prada. He often buys fakes in Hong Kong which he said is the best place to buy counterfeits, and recently made purchases in Hunan Province. He said he buys them to "show one [himself] has mingled or can mingle with the higher crowd." "In China, a show is important and if you have something to back up the glamour, you are in, whether it's a true item or not. All my friends agree on why I buy the [imitation] watches and normally end up doing the same thing later on," said Venn. What impresses him most is that the "true fakes" are so carefully detailed that one can hardly tell them apart from the original. Venn has a few imitation Rolex Oyster Perpetual Datejust watches that are so detailed that a jeweler could not tell one was fake until he actually opened it up to repair it for him. Though Chinese knockoffs have won the favor of a number of expats, some said that the allure wears off with the passage of time as they grow to value durability over brand. And as Chinese brands gain more popularity among foreigners, some of them are switching from imitation products to authentic Chinese brands. "Many of my friends have been in China a while and do not buy counterfeits anymore as they cannot hold long. I think it is more popular with newcomers or tourists wanting to go home with something to impress," said Steve. Frisby now buys more original local brands, such as Anta and Li-Ning which he buys on discount. "Now through Taobao [a popular online shopping platform in China], you have immediate access to quality Chinese brands such as Xiaomi, which, again, are half the price of American and Japanese brands and nearly as good as them. Also, I know when I buy the real item I am protected if it breaks," said Frisby. Jerry Frey, a 27-year-old Swiss, used to buy fake Nike shoes from Yashow Market on a regular basis, but now he likes Chinese shoe brands very much. His favorite is Feiyue. "Besides its good quality and cheap price, the design of Feiyue is unique. Not many people wear them in the West," said Frey. He said he also likes tech brands like Huawei and Lenovo. "They have good technology and advanced thinking. They also initiate new ideas and have very good products." Venn also loves Chinese brands and has bought Chinese-made electronics, household goods and motorcycles. "I like the motorcycles and scooters made by Chinese manufacturers. Qingqi motorcycle is a great bike and powerful enough to carry two people on it," he said. Zhou Ting, a luxury industry expert with the Shanghai-based Fortune Character Institute, told Metropolitan that expat tastes are changing. "According to our latest studies, a strong trend is emerging where they have begun to buy Chinese products including daily-use products and electronic appliances because they function well and are at a much lower price," said Zhou. Amid China's crackdown on fakes, both the Silk Street market and the Yashow Market have taken measures to fight against counterfeits. According to a Xinhua News Agency report on December 19, last summer, the Silk Street market decided to eject sellers of counterfeits and invited more Chinese independent brands to replace them. Yashow was renovated last year, also in a bid to counter fakes. According to a Beijing Youth Daily report in October, the renovated Yashow Market has given up low-grade products to focus on medium- and high-end products. "Many expats felt a bit sad when the old Yashow was closed. But I believe the counterfeiting market is now and will be dying with the advent of good quality cheap Chinese brands," said Frisby.